Ok guys, this is some high time for making some of the most important wooden furniture article out of the same shipping wood pallets. 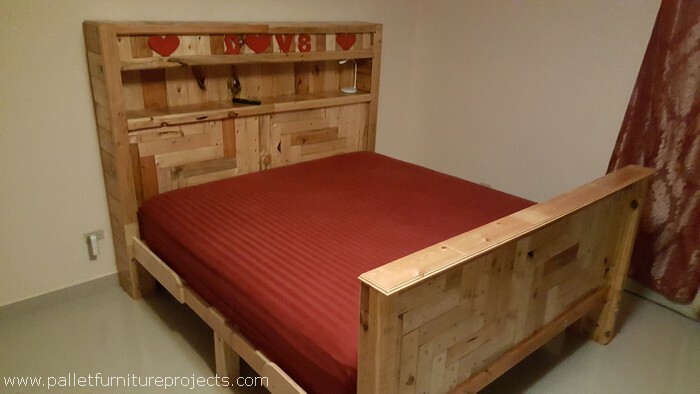 Yes, I am talking about recycling a wood pallet room bed that would cater your needs inside the bedroom. So after reading this it would have become pretty clear that now you do not need to go out there in the market to buy a room bed. 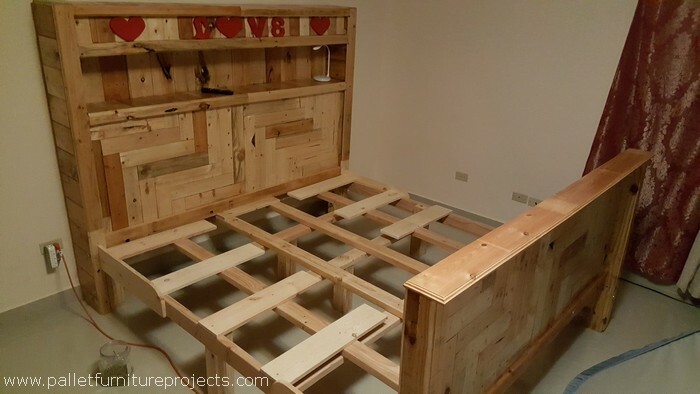 We are recycling here a king size pallet wooden bed frame, so this is obviously going to be a single unit. Let’s talk about different features and angles of the room bed. 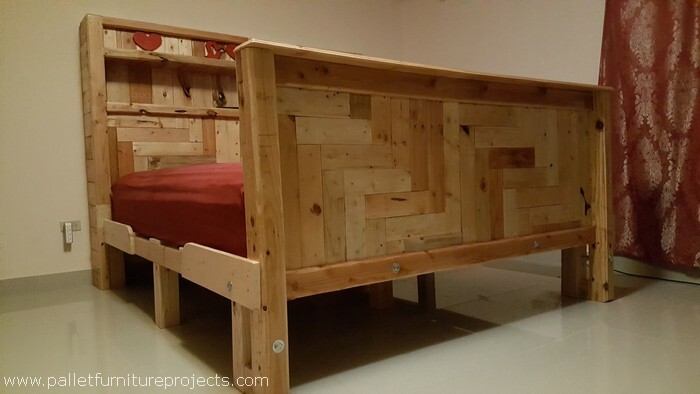 This is the font look of the room king size pallet wooden bed. 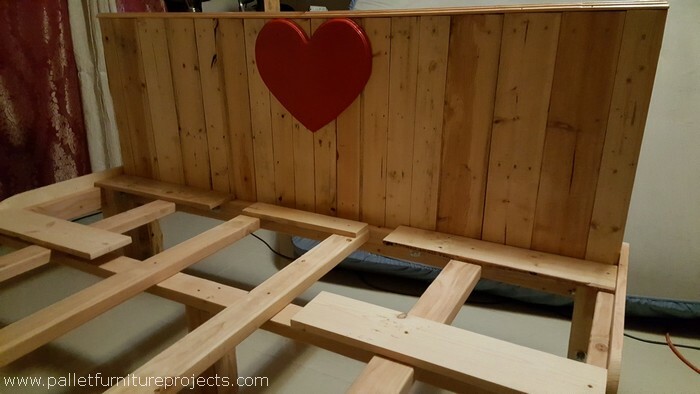 If we ponder upon the design and structure we see that not only straight wooden pallet planks are fixed here but by cutting them randomly we have created a certain pattern that looks pretty classic. 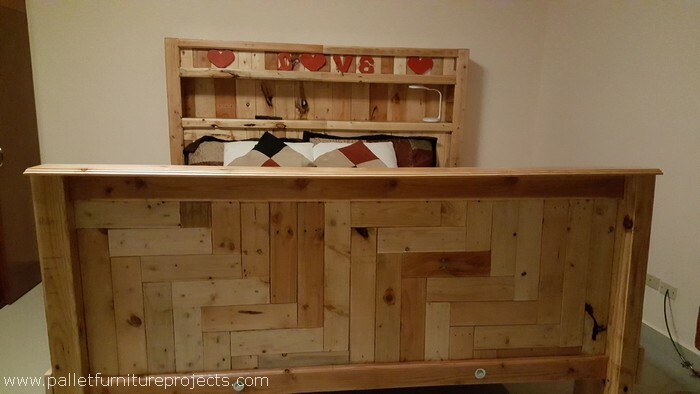 Now count on the headboard of the king size pallet wooden room bed. As this was meant to be a king size bed so this was understood that the headboard must also be pretty huge. We can see a built in shelf inside the headboard which offer ample space for displaying several decoration pieces. And here we have given you a clear look into the frame or base of the king size bed. 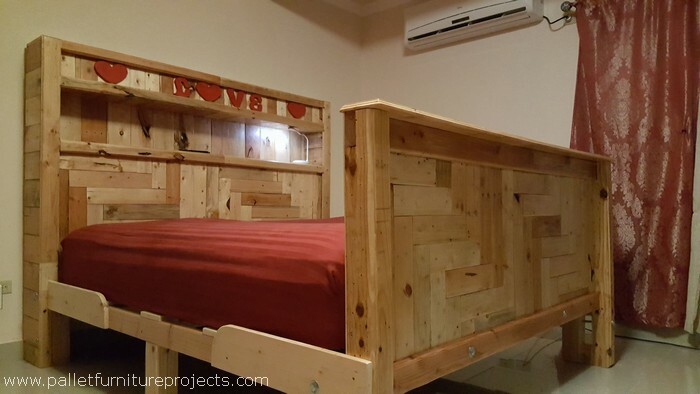 You can see the fixation of the pallet wood planks, they are fixed horizontally and vertically as well to ensure the durability of the bed so that it would sustain the heavier weights. After the horizontal and vertical fixation of the wooden pallets, we further added some robust wooden panels on the already thick layer. This was done certainly to strengthen the bed frame further. After this whole scheme, a mere cardboard is needed to be fixed on the top to flatten up the base. I give you guys a challenge that is open for all. Go in the market and just inquire about the prices, a room bed that is hardly as durable and stylish as this one, it would cost you in thousands. But here we have recycled the entire king size bed pretty free of cost. No doubt some minor expenses incurred on nails and glue etc, but if compared to the market price, this is literally nothing. 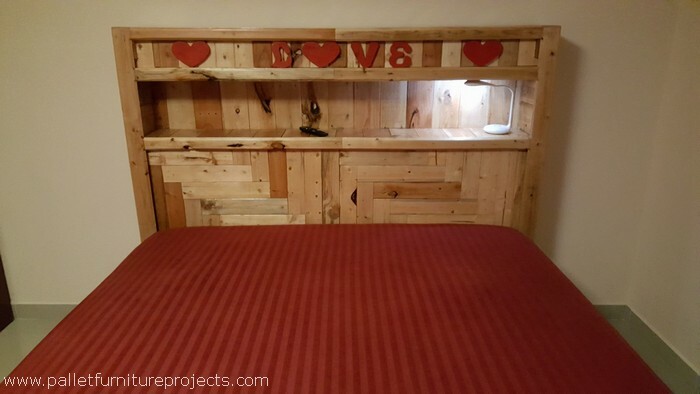 So you have to show some gratitude to the wood pallet and certainly to the pallet wood recycling skill.